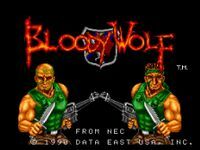 Bloody Wolf​ (ならず者戦闘部隊ブラッディウルフ, Narazumono Sentō Butai Bloody Wolf, "Rogue Combat Squad: Bloody Wolf"), released in Europe as Battle Rangers, is a run and gun arcade game released by Data East in 1988. Two commandos take on an entire army with many weapons, and defeat bosses to advance levels. This game was quite notorious for its poor translation, or Engrish. Snake and Eagle, two commandos of the Bloody Wolf special forces, receive instructions from their commander to destroy the enemy's weapon base and rescue any allies who have been reported as Missing in Action, as well as the President. The game uses a side-view and employs a multi-directional attack method similar to many other arcade games of the run and gun genre, including Guerilla War, Ikari Warriors, Mercs and Data East's own Heavy Barrel. Allowing up to two players to play simultaneously, once players create their own codename using up to three initials, they receive a quick mission briefing before the mission ensues. Players automatically begin the game with a machine gun containing unlimited ammo and a knife used exclusively for close quarters combat. The mission's levels are separated into "scenes" and usually consist of one or more players running through various terrain, attacking hordes of enemy soldiers, and reaching the end of the stage to battle a boss. Amidst all the getting of the hot bullets of shotgun to die, players have the option to rescue various hostages scattered throughout the levels to obtain new weapons or items. Source: Wikipedia, "Bloody Wolf", available under the CC-BY-SA License.